FULL RENOVATION, ALTERATION & RESTORATION. An early 20th century Arts & Crafts villa with a charming attic level, this home was last renovated in the 1980s and was looking very tired, and rather dated in the room configuration. 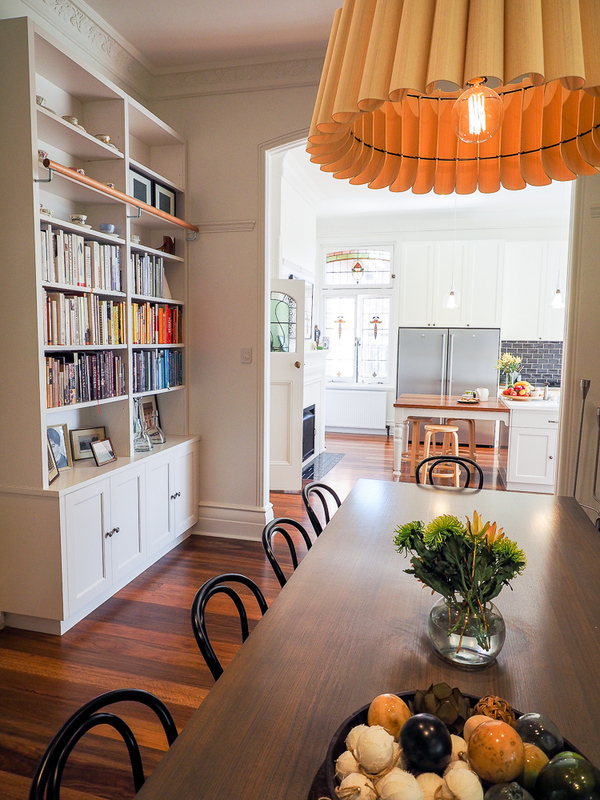 We re-worked the layout to suit a busy young family, making the Kitchen the heart and soul of the home by relocating it in what had been the formal Dining room, and transforming the Parlour into a new, much more welcoming, Dining room, now beautifully linked to the Kitchen via the original archway. 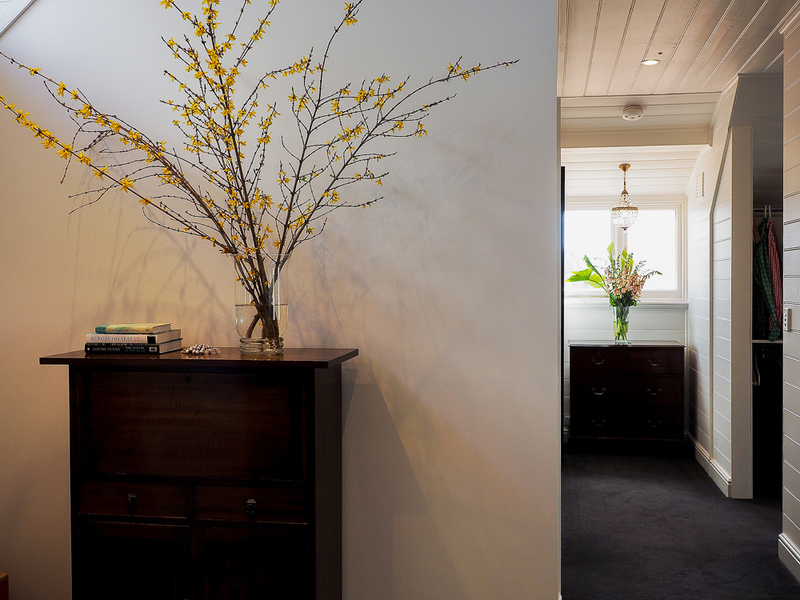 All rooms were renovated to make the house consistent in materials & style, using quality fittings throughout. 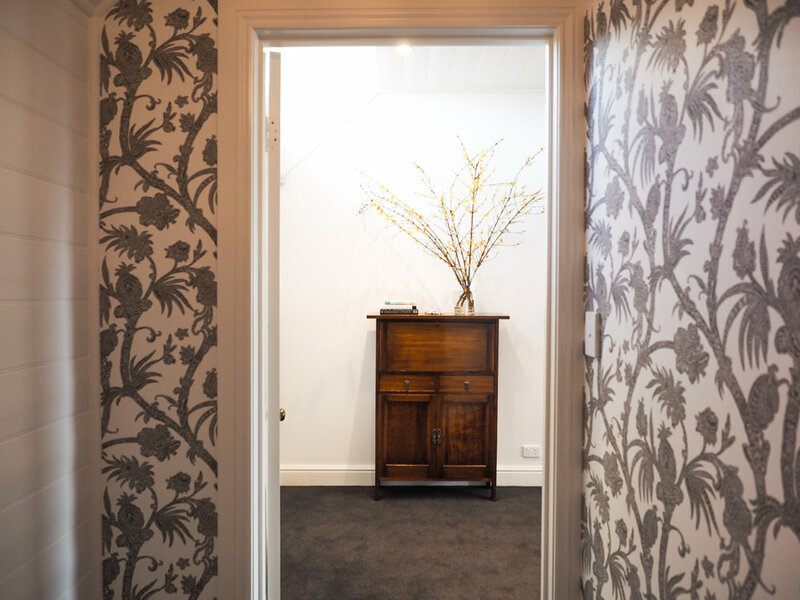 The house was lavished with care and attention from top to toe, with original elements restored and re-used wherever possible. Sweet little crystal chandeliers were polished and re-hung in new locations upstairs to catch the natural daylight. Leadlight was repaired and replaced where glass had broken, and a marathon effort of sanding and painting brought the elegant timberwork back to life. Materials and fittings were selected for longevity and quality, as befits a house this beautiful. In a house with incredible leadlight in almost every room, the arched window (in what was the formal Dining room) is a heart-stealer. As one of the owners loves to cook, and the other loves to garden, where better to place the Kitchen than in the room with a lyrebird leadlight window overlooking the new veggie patch? 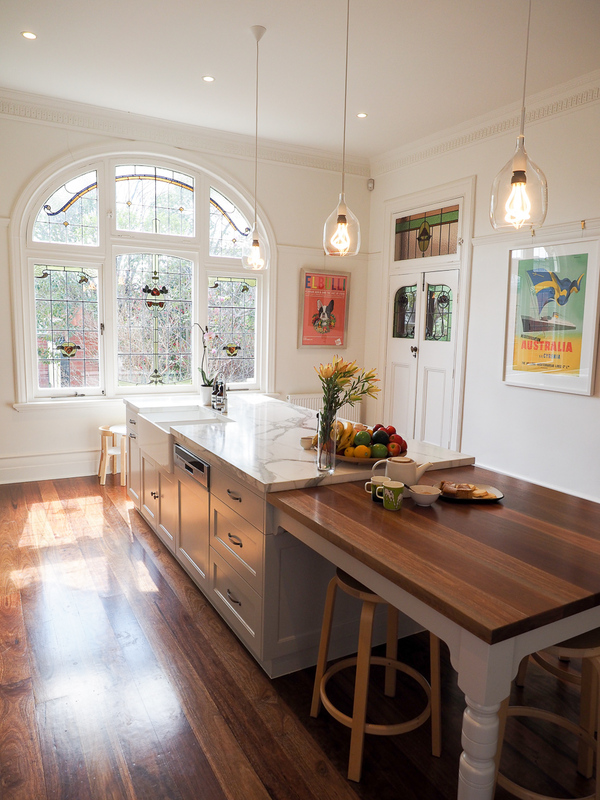 To encourage lingering and lounging amongst beauty, we built a window seat in the original Edwardian bay window. (With a couple of drawers below for lego and toy storage.) A seat cushion of emerald green Fermoire Irish linen made this space inviting, and visually links to the garden beyond. My lovely client had assembled a collection of wonderful fabrics & cushions over the years. We made up new cushions from these fabrics, and mixed them in with existing cushions she had, to reflect the colours of the leadlight, and of course that gorgeous garden visible through each and every charming window. A book-lover’s dream, masses of custom-built bookcases were tucked into every spot we could find - complete with a hand-made oak sliding ladder to reach all those lovely books. The main bedroom was relocated upstairs to take advantage of the incredible views, so we worked with the original staircase to create a fun journey between upstairs & downstairs. 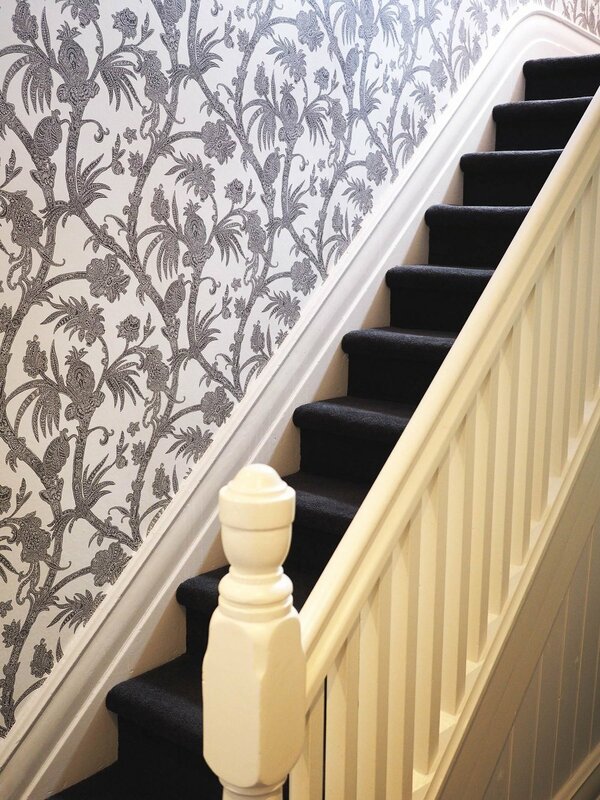 American wallpaper in a monochrome colourway brings in a touch of the botanical setting, in an elegant sweep of twirled leaves & stems. 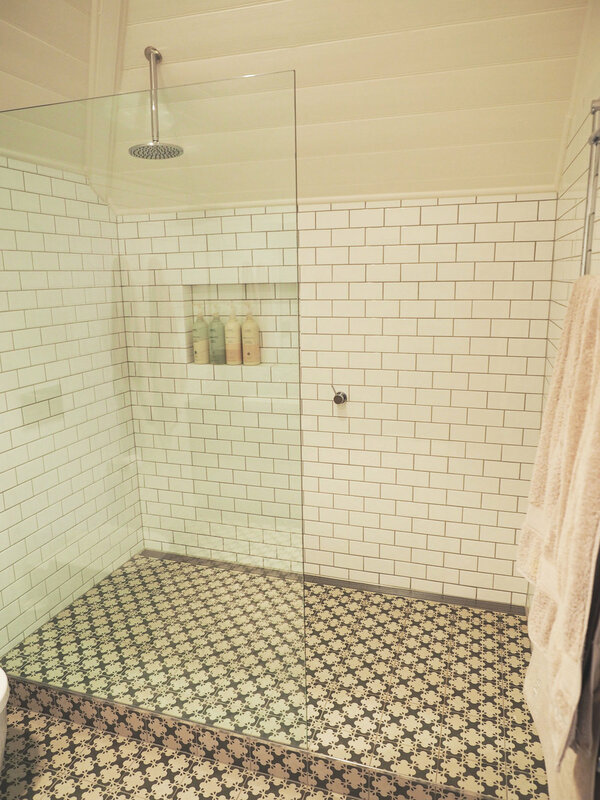 The original hall tiles, in black & white marble, were retained and polished. Where grooves showed the passage of time, we worked with it to honour the stories the house holds. The palest of pale apple blossom green, from Porters Paints, adorns the walls & forms the perfect backdrop for the eclectic & dramatic art collection. 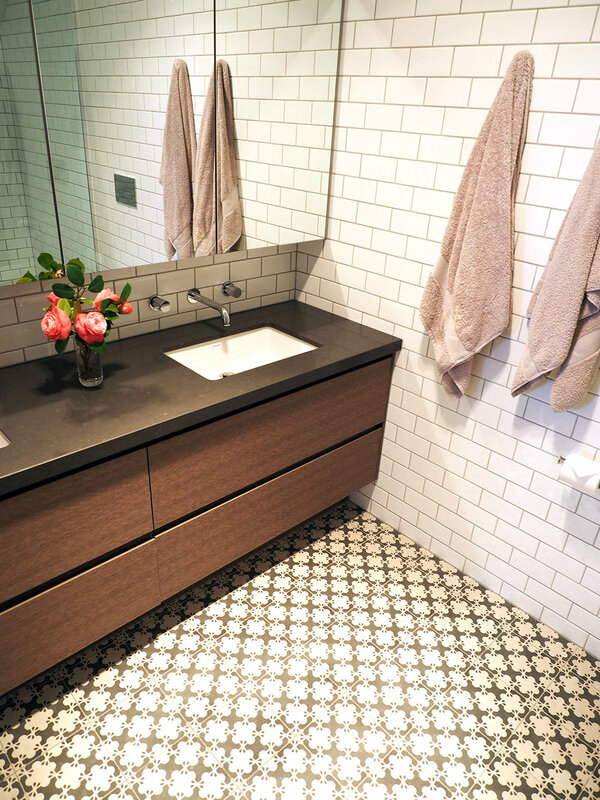 Chequerboard tiles in the new Powder Room reference the original black and white marble chequerboard floor tiles in the entrance hall. A recurring colour throughout the finishes, this gloriously pale (Granny Smith) apple green dado tile has all the freshness of an Edwardian garden, and forms the perfect background for the owners to place fresh cuttings from the garden on the charming antique oak cabinet that my client already had from her previous home. As an inherited piece of furniture, it comes with a story attached, so it’s wonderful to be able to find homes for items like this - so they continue to be loved for generations to come. Up on the Attic level, we embraced the wonderful angles from the complex Federation roof, lining the ceiling in the Ensuite with timber lining boards in a traditional manner, and contrasting it with very simple and contemporary Australian-made Astra Walker tapware. 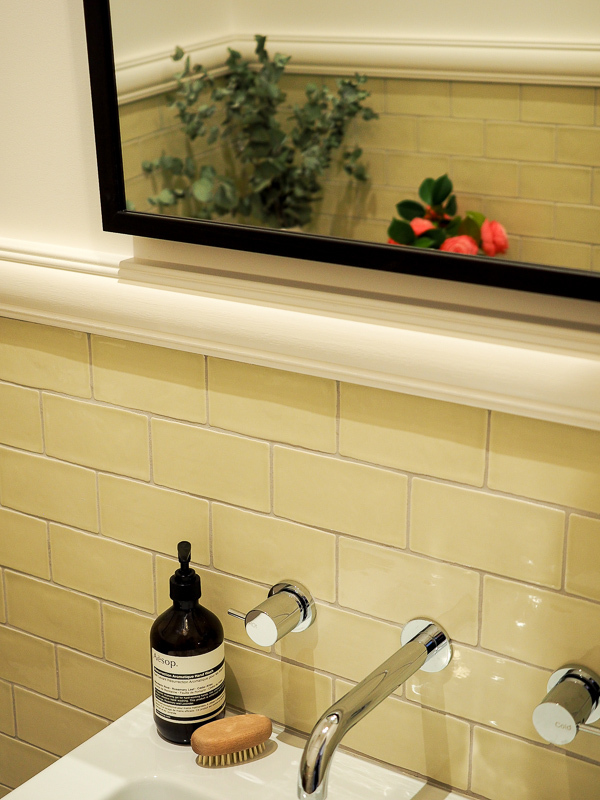 A nod to the turn of the 20th century era in the subway tiles, brought into the 21st century with simple joinery that allows the beauty of the stone & timber materials to shine. With timber drawers, stone benchtops and Spanish floor tiles, the Ensuite uses classic finishes which echo the timelessness of the original Edwardian building.